Our pets need to keep their weight in line and stay in shape just like we do, and a great way to help them do it is to have them exercise. Walking or jogging with them, playing fetch, having them play with toys, swimming with them, and agility classes are some of the fun pet exercise options suggested by The Early Show's resident veterinarian, Dr. Debbye Turner. She points out that obesity isn't only a serious problem among humans -- it's a big one in the pet population, as well, and can shorten their lives by causing or worsening joint disease, liver disease, and diabetes. 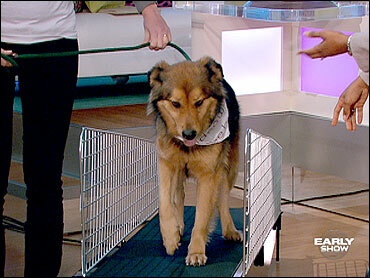 Always consult with your veterinarian before starting your pet on any exercise program, Turner stressed. Start slowly, also as people should; your pet should ease into exercise. Humans can't run a marathon the first time we go for a jog; nor can pets. Start with just 10-15 minutes of light activity, such as moderately-paced walking. Take cues from your dog. If he starts excessively panting, lying down, etc., then give her some rest. Slowly build up to 30 minutes, 3 times a week. For very athletic breeds, you can increase that to an hour a session. An alternative to walking or running is vigorous play with your pet. For dogs, a good game of fetch will provide plenty of exercise. Cats have a natural prey instinct, so they love chasing and hunting. Using a feather on a string or a laser pointer will keep your kitty batting, swatting, and getting a good workout. Swimming is an excellent form of exercise for medium-size and big dogs. It's no-impact, so isn't harmful to their joints. This is particularly good for older dogs, and dogs suffering from arthritis or other joint diseases. Enrolling pets in an obedience or agility class can provide great exercise for both your pet -- and you! And, if you have the time and space in a fenced-in yard, you can teach your dog some agility moves yourself with the right equipment. You can even put a pet on a treadmill! Turner notes that you should provide plenty of fresh water before, during, and after the workout. Be especially careful when exercising pets with "flat faces," such as pugs, bulldogs, Boston terriers, and Persian cats. They're particularly susceptible to respiratory distress. Also, be careful with dogs that have long bodies and short legs, like dachshunds. Some toy breeds aren't suitable for strenuous exercise. And don't over-do it with young puppies. Conversely, be very careful when exercising an old pet. They just can't take the physical demand like a young one can. Turner also raised a caution flag about exercising your pet outside during the heat of the day. Take him or her out early in the morning or late in the evening, to avoid heat stress and over-exhaustion. Also avoid going outside when the humidity is high. Dogs don't sweat like humans, so they aren't efficient at eliminating excess heat. Also, avoid running on pavement or hard surfaces during hot weather. Those surfaces get very hot and can burn your dog's foot pads. Plus, gravel surfaces can be uncomfortable for your dog. The dogs and cats on the Early Show set, and many, many others are available for adoption from Bideawee. For details, visit Bideawee.org.